Now the glorious Polycarp at the first, when he heard it, so far from being dismayed, wanted to remain in town; but the greater part persuaded him to withdraw. So he withdrew to a farm not far distant from the city, and there he stayed with a few companions, doing nothing else night and day but praying for all men and for the churches throughout the world, for this was his constant habit. for it was impossible for him to lie concealed, seeing that the very persons who betrayed him were people of his own household. And the captain of the police, who chanced to have the very name, being called Herod, was eager to bring him into the stadium, that he might fulfill his appointed lot, being made a partaker with Christ, while they — his betrayers — underwent the punishment of Judas himself. and on their consenting, he stood up and prayed, being so full of the grace of God, that for two hours he could not hold his peace, and those that heard were amazed, and many repented that they had come against such a venerable old man. But when at length he brought his prayer to an end, after remembering all who at any time had come in his way, small and great, high and low, and all the universal Church throughout the world, the hour of departure being come, they seated him on a donkey and brought him into the city, it being a high Sabbath. Then they, failing to persuade him, uttered threatening words and made him dismount with speed, so that he bruised his shin, as he got down from the carriage. And without even turning round, he went on his way promptly and with speed, as if nothing had happened to him, being taken to the stadium; there being such a tumult in the stadium that no man’s voice could be so much as heard. But as Polycarp entered into the stadium, a voice came to him from heaven; “Be strong, Polycarp, and play the man.” And no one saw the speaker, but those of our people who were present heard the voice. And at length, when he was brought up, there was a great tumult, for they heard that Polycarp had been apprehended. When this was proclaimed by the herald, the whole multitude both of Gentiles and of Jews who dwelt in Smyrna cried out with ungovernable wrath and with a loud shout, “This is the teacher of Asia, the father of the Christians, the puller down of our gods, who teaches multitudes not to sacrifice nor worship.” Saying these things, they shouted aloud and asked the Asiarch Philip to let a lion loose upon Polycarp. But he said that it was not lawful for him, since he had brought the sports to a close. These things then happened with so great speed, quicker than words could tell, the crowds immediately collected timber and sticks from the workshops and baths, and the Jews more especially assisted in this with zeal, as is their custom. But when the pile was made ready, divesting himself of all his upper garments and loosing his belt, he endeavored also to take off his shoes, though not in the habit of doing this before, because all the faithful at all times vied eagerly who should soonest touch his flesh. For he had been treated with all honor for his holy life even before his gray hairs came. I bless You because You have granted me this day and hour, that I might receive a portion amongst the number of martyrs in the cup of Your Christ unto resurrection of eternal life, both of soul and of body, in the incorruptibility of the Holy Spirit. May I be received among these in Your presence this day, as a rich and acceptable sacrifice, as You did prepare and reveal it beforehand, and have accomplished it, You that art the faithful and true God. When he had offered up the Amen and finished his prayer, the firemen lighted the fire. And, a mighty flame flashing forth, we to whom it was given to see, saw a marvel, yea and we were preserved that we might relate to the rest what happened. The fire, making the appearance of a vault, like the sail of a vessel filled by the wind, made a wall round about the body of the martyr; and it was there in the midst, not like flesh burning, but like a loaf in the oven or like gold and silver refined in a furnace. For we perceived such a fragrant smell, as if it were the wafted odor of frankincense or some other precious spice. So at length the lawless men, seeing that his body could not be consumed by the fire, ordered an executioner to go up to him and stab him with a dagger. And when he had done this, there came forth [a dove and] a quantity of blood, so that it extinguished the fire; and all the multitude marveled that there should be so great a difference between the unbelievers and the elect. 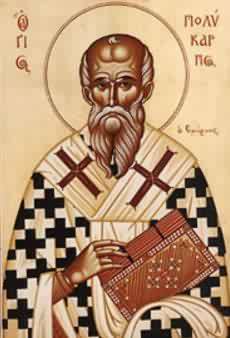 In the number of these latter was this man, the glorious martyr Polycarp, who was found an apostolic and prophetic teacher in our own time, a bishop of the holy Church which is in Smyrna. For every word which he uttered from his mouth was accomplished and will be accomplished.